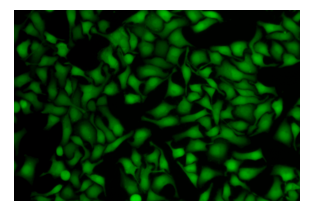 Abbkine Live Cell Tracking Kit (Green Fluorescence) provides a versatile and well-retained celltracing reagent (CellTracker Green) for monitoring cell movement, location, proliferation, migration, chemotaxis, and invasion. CellTracker Green can passively diffuses into cells and remain colorless and nonfluorescent until its acetate groups are cleaved by intracellular esterases to yield highly fluorescent, amine-reactive carboxyfluorescein succinimidyl ester. The succinimidyl ester group reacts with intracellular amines, forming fluorescent conjugates (Ex/Em= 494/521nm) that are well-retained and can be fixed with aldehyde fixatives. Fig. Hela cells stained with Abbkine Live Cell Tracking Kit (Green Fluorescence). • Useful for monitoring cell movement, location, proliferation, migration, chemotaxis, and invasion. • The CellTracker Green probes are well retained in living cells through several generations and can display fluorescence for at least a week. The probes are transferred to daughter cells, but are not transferred to adjacent cells in a population. Cell movement and location studies require specialized probes that are nontoxic to living cells. Commercial Live Cell Tracking Kits provide a convenient method for monitoring cell movement, location, proliferation, migration, chemotaxis, and invasion.